That’s precisely the experience I had, darting from room to room and hall to hall, desperately trying to look beyond the words that were written or carved or engraved onto the numerous objects of the past. Eventually, I found myself drawn to a porcelain dish from the Qing Dynasty, and later on the fresco-secco painting in the MFA’s Chapel Gallery. This is essentially a combination of the two foci I was originally considering: Pottery, and religious artifacts. I found both objects fascinating in their use and presentation of language, as well as their mode of conveying meaning in general. With our previous readings in mind, here’s to hoping my analyses does the items’ significance justice. To begin with, I was struck by the differences between my two chosen artifacts in relation to size, type, and immediacy. The fresco-secco painting is a dominating work that encompasses an entire wall, having previously decorated a church apse in Spain. 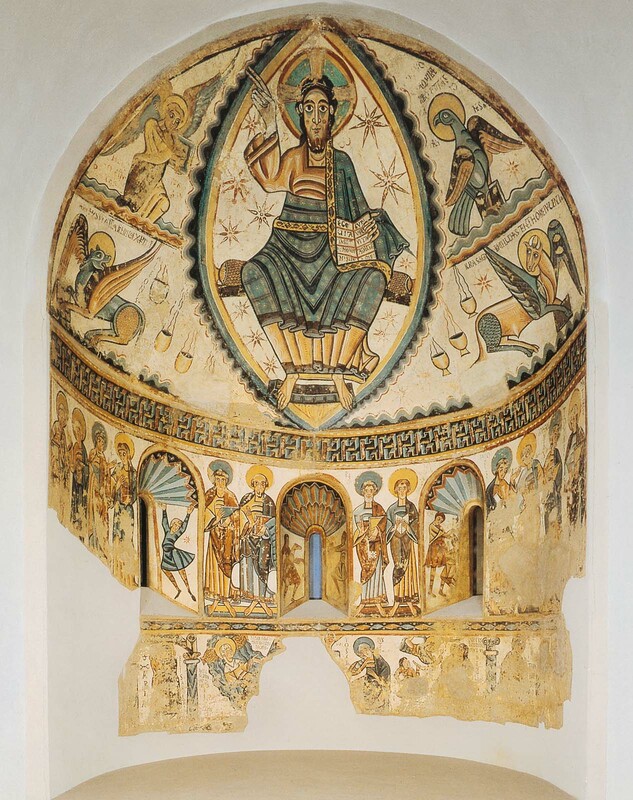 According to the Wikipedia article on fresco-secco paintings, this technique of layering paint onto plaster makes it much less durable, yet easy to fix and preserve, as the paint rests as a separate layer on top of the plaster and is fully opaque. Similar murals can be found in Egypt. But, ensuring minimal mistakes to cover up also means that creating such paintings is a much longer and more involved process, thus meaning each production and iteration of this painting cannot be achieved in a shorter timeframe. It also meant that perhaps only an artist well-versed in this technique (and trusted by the members of the church?) could produce such a painting, in comparison with an amateur’s sketches. The porcelain dish, on the other hand, is comparably far smaller and more portable than the fresco-secco painting. According to the Wikipedia article on Chinese ceramics, the Qing Dynasty (1644-1911) marked a time during which ceramic-making supplies were readily available to both foreign residents and domestic authors, and porcelain itself had already been in circulation via foreign exports since the late Ming dynasty just prior (1368-1644). This meant that ceramic products like the dish were being mass produced by an industrialized, commercialized culture, already filled with skilled hands and talented designers. 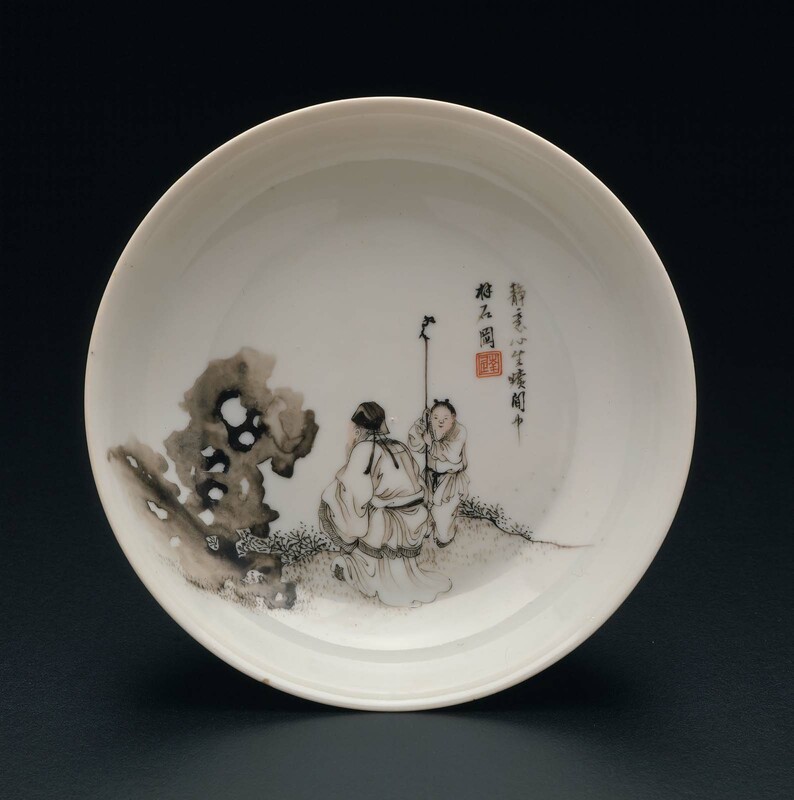 A quick round of Googling even shows that the exact scene being depicted in the dish was similarly featured on a number of other mediums as well, including a snuff bottle, a fan, and a hanging painting on a scroll. By contrast, the structural integrity of porcelain and added durability of the glaze means the painting and inscription are far more preservable than the painting is, but equal in the sense that corrections can be easily done without disrupting the overall product. The visual nature of the two artifacts are also undeniably striking, as there are many similarities in how they function as part of the objects’ textuality, specifically in how the text within each item informs and reinforces its images. The painting was originally located in the semicircular area behind the church altar, an area that is constantly in full view of all the churchgoers. What was originally intended for a small Christian congregation (“in the foothills of the Spanish Pyrenees”) is now located in a museum for a much larger audience of all backgrounds and beliefs. This greatly expands the scope of its original intentions regarding target audience. Christ’s positioning in the painting and the inscription on His book is meant to illustrate the centrality of his role within the religion, therefore working in unison to convey the painting’s meaning. And, as Liu mentions, “New media are old; and old media new.” This religious artifact is not only a relic of the past, but it continues to capture the essence of current religious practices and beliefs and similar attempts to provide a representation of Christianity (think: Michelangelo). The dish may have been part of a larger movement of Mi Fu-based works in China and elsewhere, such as Korea. The globalized nature of the ceramics and this specific moment apparently demonstrated by Mi Fu alludes to a collective culture of arists and scholars who are familiar and identified with Mi Fu’s eccentric words and deeds. Admittedly, I’m unsure of the dish’s function, whether it was intended to be purely decorative or used in daily life. I’m leaning more towards the former, given the more elaborate design that features both an image and text. The first half of the inscription doesn’t seem to directly speak for the moment being depicted, while the second half is just a simple summary of the scene. The artifact description also specifically mentions that the color scheme is in line with the “ink style favored by Chinese scholars,” once again referencing an intellectual, artistic culture that had a stake in the commercial production of ceramics. What I found most exciting was the fact that both artifacts featured prominent cultural figures as represented through the artists’ perception. Jesus was known for preaching the Gospel throughout His life, having remained a distinctively influential figure to this day. Similarly, Mi Fu himself was an artist and scholar, presumably having influenced many likeminded individuals across Asia. Because of this, I feel that those affected by the illness depicted in Butler’s “Speech Sounds,” whether that be in terms of reading and writing, or speaking, would still be able to recognize the images if they had been exposed to the same cultural circumstances. In context of Plato’s “Phaedrus,” it makes me wonder then whether the teachings of a religious figure like Jesus himself would still be as vital and recognizable to Christian practices if the Bible didn’t exist. Based on my experiences with Chinese literary culture, there still is a hint of an oral and aural culture in the passing-down and sharing of poetry, though academic pursuits have since greatly eclipsed said culture with demands of more reading and writing instead. Overall, this lab was extremely informative in helping me realize that, although there are so many artifacts from so many cultures and so many time periods sorted and categorized throughout museums like the MFA, it is by in-depth analysis of their textuality that allow a surprising amount of similarities to be brought to light. In addition to this, the use of images and visual stimuli does not necessarily negate the presence of textuality, as all such works strive to convey meanings in various ways, even without the use of a recognizable text or alphabet. Created by Ryan Cordell in Jekyll using the theme Feeling Responsive by Phlow. All course materials, including policies and assignments, are licensed CC-BY.